Browse: Home / 2017 / December / 01 / Part 7 The Llewellyn frame casting story. 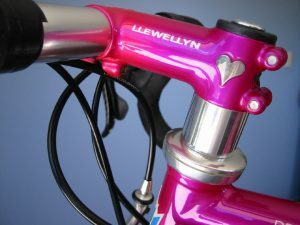 For many years I was making fillet brazed stems to compliment a client’s Llewellyn bike. This came about in the 90s when I was asked to make quill track stems for the trackies. We had a good and fun track racing scene in Queensland but I felt the introduction of summer crits started to demolish the track season which I was not all that pleased about. The growing MAMIL population found it easy to sit on a wheel going around some dull flat circuit that did not even have a corner in it that you had to lift a pedal for, pretending they are Robbie McEwen, compared to riding on the track which took considerable skill, fitness and race craft. (Robbie did ride track in his early days) It is hard to be just an equipment poser when racing track, you look like a real dork if you cannot ride/race the track with grace and technique. Any how I made the track stems from Chromoly tubing, machined the clamps and binders for the steel track bars on the most beautiful thing, a lathe. Chaps and lasses won many Aussie titles on Llewellyn frames and there was a couple of world junior champions as well, on their way to the Aussie national team. Then someone asked me to make a threadless stem for their new lugless Columbus Mega tubed Llewellyn road frame. Yeah, I can do that, so I then made a threadless fork stem for him and that resulted from then on in most Llewellyn frames having a matching stem perched on the fork. Then later I added a machined head spacer from aluminium to grace the set-up, rather than a stack of alloy or plastic spacers. It was a frame, fork, stem, spacer to complete the set, it all was becoming what I consider a “frame set”. It helps flesh out the order book and adds to the invoice which means you stay in business. After all, this is not my hobby, it is my chosen path of professional expression. As the first decade of 21st Century rolled on I was making an increasing number of lugged frames again. YAY! 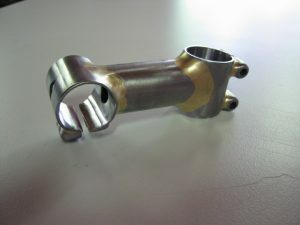 I was trying to stretch my skills with the stainless polished caper, but I began to be dissatisfied with matching up a lugged frame with a lugless stem. It did not seem right to my thinking and my aesthetic desire. I tried one of those lugged stem kits that LongShen produced, but the bar lug had issues, it was for a handle bar that needed to be 26.80 mm in diameter (which is nonsense), so I had to braze a sleeve in and then bore out to 26.00mm in the lathe to fix that. The fork clamp was only for 1” steerer tubes. The extension tube was drop shaped, which was a terrible thing to mitre and fit up for good brazing and it looked too deep for my aesthetic tastes. I made only one stem using that lugged kit. Move on said I. 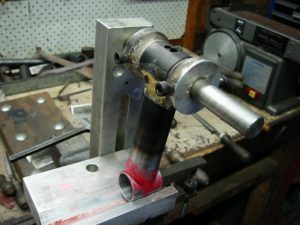 Around 2003- 2004 the urge to create and produce a stem lug set that does not exist for my needs at the Llewellyn workshop bench was festering into a “need to make happen.” 20 years after that thought passed about inside my cranium “that one day I want to design and make frame castings” I started seriously going down the pathway to do this. I will often be working away at the bench and a thought will come into the light, I have to stop and go to some scrap paper or my work diary and scribble down ideas and designs. I have done this since I was a budding artist at primary school. I was encouraged to always put it on paper before it is lost. This ingrained habit can cause the flow of some work and other tasks such as typing, posting on forums to be broken as one crams more into each working day, but it is important to me to not to lose the moment so I break the flow and sketch, scribble or make the phone call and so on. Some times I wish I kept all of these drawings and sketches, however I am not on a mission to make a legend of myself and thus keep every bit of paper of my life to regurgitate the banal details to others at a later date or for some museum. I am encouraged by others and with some hesitation on my part to tell the story of Llewellyn. Yeah, perhaps it is part of marketing as well, however I will only give a limited energy to it, because I have other metal working hobbies that scream at me to devote more and more time exploring. If I had the millions in the bank, I would stop making bike frames this afternoon as I can easily sate all my metal working desire via my model engineering projects. Anyone about who would like to Llewellyn outright ? ? ← Part 6 The Llewellyn frame casting story.